1 fleece, 3 soft-shells, 1 hybrid, 2 hard-shells, 3 synthetic insulated and 2 down… of course I needed one more! The manufacturer states the average weight of a medium size is 15.5 ounces. My own scale measures my size large at 17.5 ounces. 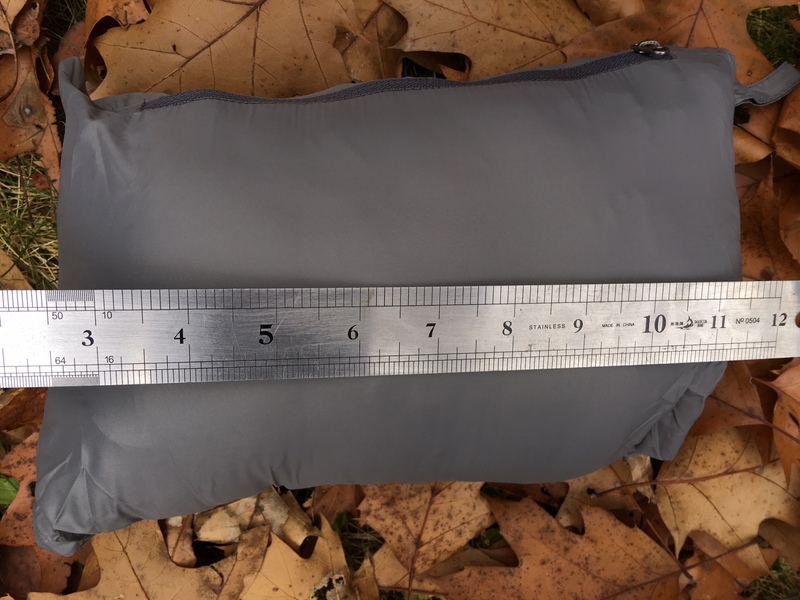 The closest insulated hooded jacket I have is my Wild Things Belay Jacket which weighs in at 24 ounces! This jacket when stuffed into its internal pocket only takes up about 240 cubic inches of space, less than a football (pre-Deflategate of course). Dimensions when stuffed are about 8 x 6 x 5 inches with some room to squish smaller. 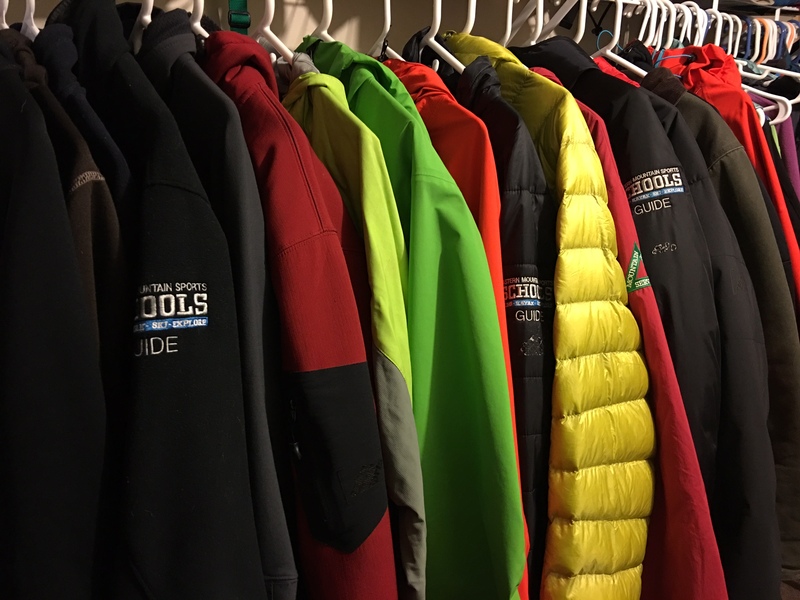 Back to the jacket… and one other important piece of the “insulation equation”. Knowing that a jacket uses 800 fill power down is only useful if you know how much of that awesome fluffy stuff is shoved into your jacket. I had guessed it was 4-6 ounces but I wanted to know for sure and since this important tech spec was not listed on EMS.com I tracked down the Product Manager. The final answer? 5 ounces of 800 fill DownTek. That’s pretty darn good for a jacket in this price range! In hand it is very soft and light to the touch. Color: As best as I confirm this will only be available in two colors this season. “Jet Black”, which is actually two toned (still boring), and “Warm Olive” which looks like no olive I have ever seen, whether warm or cold. Where do they come up with these color names? UPDATE 9/18/16: The new colors are out for this Fall! You can see them here! Pretty much every technical jacket I own has a hood. Even some of my long underwear has a hood. A hood makes a jacket so much more valuable in the mountains. This hood fits over my climbing helmet perfectly. There is an adjustment in the back to pull the sides back a bit so you don’t loose your peripheral vision and get ambushed by a moose. Pre-packing for the day to maximize space. 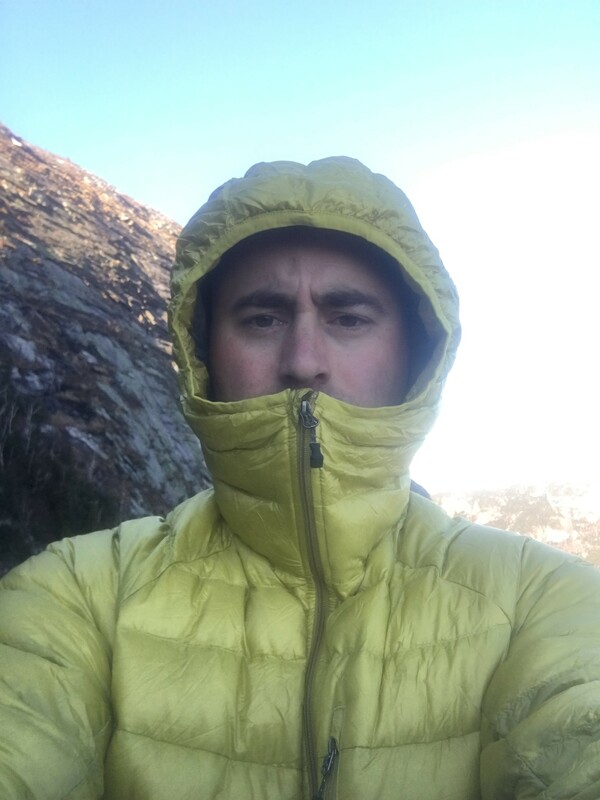 Once the jacket gets deployed it’s probably going to be going on and off through-out the climb (that’s why they call it a belay jacket, you wear it while belaying, not climbing, unless it is really cold… but it doesn’t get really cold in NH does it?) 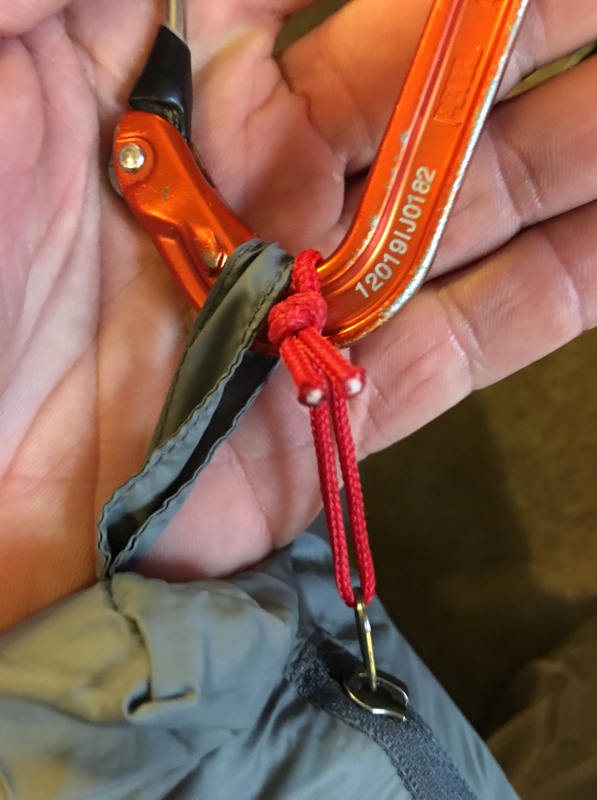 Taking the time to stuff it back into its pocket would be silly, just shove it in the top of your pack and get climbing! Single pitch ice/alpine climbing, to clip to the back of my harness if I’m leaving my climbing pack at the base. There is a small sewn loop here for this reason, but I would be concerned about that loop being the sole attachment between me and my warmth at the top of an ice climb so my solution was to make the added zipper pull a little bigger so it could be clipped with the loop. Ah, EMS Sizing. So reliable. So time tested. So never-the-same-two-years-in-a-row. Humans are hard creatures to fit. So this is what I’ll do. I’ll give you my measurements, and hopefully you’ll have a good guess at what size you need (since you’ve already decided to buy the jacket if you have read this far). I’m 5’9″, 180lbs, 42 inch chest, 34 inch waist, broad shouldered, average ape index (nice way of saying normal length arms). I tried the medium on first at the store (over a t-shirt and sweatshirt I was wearing. If felt pretty good, a more athletic fit. A bit too tight in the shoulders when I stretched forward (remember, broad shoulders). When I would lift my arms up (ice climber pose) it got a bit too snug to have full range of motion. I tried the large. The large may be a smidge roomy for me, but it definitely didn’t feel like a boxy house. Plenty of room inside for my skin/mid-layers/softshell (or hardshell). This is an excellent cold weather jacket at a great price suitable for winter backpacking, hiking, ice climbing, or waiting for the bus. You can purchase this jacket in both men’s and women’s, hooded and not hooded, right here. Disclaimer: The author purchased this jacket with his own money. This post contains affiliate links that help support this blog. David – just wrote a post that I think disappeared when I logged in. 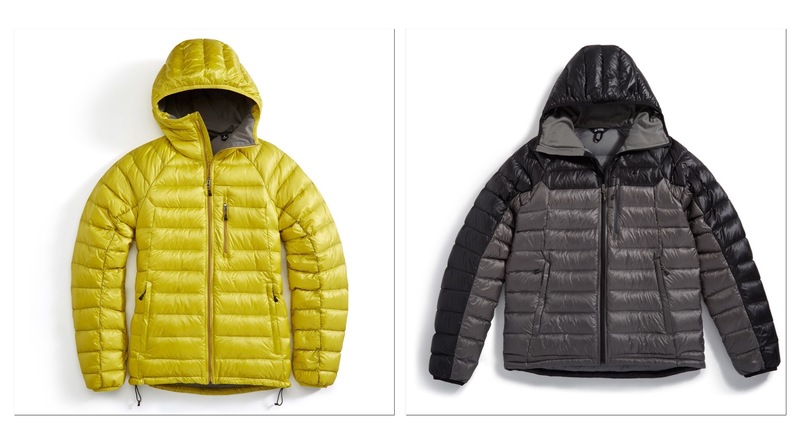 Anyway – How do you think this jacket would do as my belay jacket. Thinking for cold cragging days and multi-pitch ice days alike. 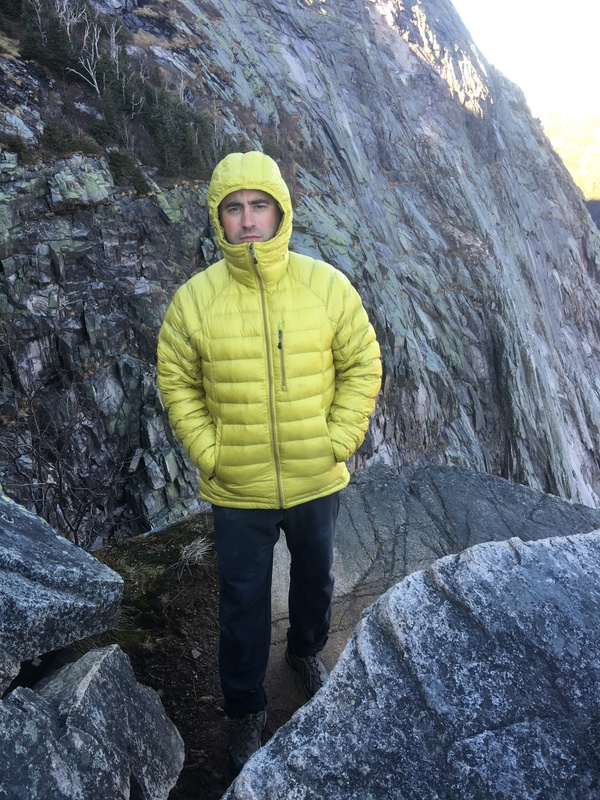 I have a first ascent jacket that is massive and really warm, but mostly overkill. Is this one warm enough? And I somehow missed this question, sorry for the delay. I think this would be ok “if” you are leading in blocks and moving pretty quick. Definitely not as warm as a traditional weight belay jacket. Crazy sale right now, got mine for $84.99 shipped. Any chance you’d like to sell your Warm Olive down hoodie? Hi Pete, I had a few too many jackets so I gifted this to my father who is loving it. Sorry I can’t help you out here! Hopefully they make it in this color again!